If you’ve been with me for any length of time, you know that my faith is very important to me. It guides my every move with my husband, my kids, my business…every facet of my life. 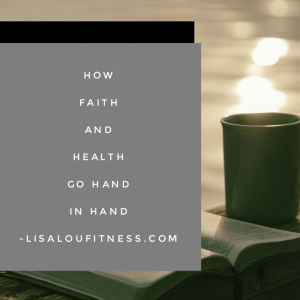 I thought it was time to help you to see how your faith can bring amazing changes and benefits to you both body and soul! You are amazing, do you know that? No, really. It’s even written about you. You are, “fearfully and wonderfully made.” Psalm 139:14. We all are. We were designed in the most amazing way for the most wonderful things! Unfortunately, too many of us forget how intricately we were created. We focus too heavily on the physical – especially this time of year – forgetting there’s so much more that needs tended to. In fact, did you know you’re more likely to be successful in your physical health goals if you recognize that your body is connected to your mind and spirit? You aren’t just a physical being. You’re a spirit that was created to be BRAVE and POWERFUL, you have a mind that was intended by its creator to be SOUND [2 Timothy 1:7], and you just happen to have a body that is connected to the two. These three parts of you are intertwined. What does this tell you about your innate ability to keep the body you were given healthy as a brave spirit with a sound mind? Seriously, how can you NOT see results of health and wholeness when you really, truly recognize these truths? In addition, as created beings, we were designed to desire God. Many times we try to fill that desire with other things (food, drink, social media…). Next time you face temptation to seek that fulfillment outside of Him and healthy things, take some time to talk with Him first. We care about so much more than just your physical body, because we know it takes a focus on the entire woman to help her be who God desires her to be. Here’s to a new year of finding our focus in what truly matters and making God the center of all we do! Wow this is so good Lisa, glad I came upon this.